Will actions speak louder than words in the ongoing STEM discussion? Over the last 10 years the acronym STEM (Science, Technology, Engineering and Math) has become a buzzword in many circles. Is it possible that like many pop culture expressions, the clever acronym-word duality that is “STEM” will fade into obscurity once its use (or misuse) has been exhausted? STEM means different things to different audiences with varying degrees of overlap in meaning. For some it excludes any reference to medical professions; for others, it is an all-encompassing term to mean anything remotely related to science. The acronym was first introduced by Judith Ramaley, the director at the National Science foundation, in 2001 for policy making purposes . Since then the term has become the go to buzzword for policymakers, academics, and the public regardless of whether its use is appropriately employed. I’ve written, debated, read, and listened to the merits of a STEM educated workforce. But as we look towards the 15 year anniversary of the terms coinage, I sometimes wonder if anything profoundly meaningful will come from the conversation. Don’t get me wrong, a productive conversation is one worth having; however one must ask at some point: has this STEM conversation really been productive considering how much of it has translated into meaningful action? Have we gotten so complacent with the use of the term that we simply employ its use as a policy filibuster or has the definition of STEM become so “muddled” that many of the key stakeholders are frequently and unintentionally talking past each other? Today more than ever, as we react to the effects of globalization and rapid technological advances, we embrace the idea that without a sustained STEM educated workforce, the U.S. will fall behind as a global leader. This has been highlighted in President Obama’s past and most recent State of the Union address where he has stressed the importance of both preparing students to succeed in the global economy, and supporting a STEM workforce to optimize economic growth. If this is our commitment, then how many more articles have to be written, debates had, speeches made, and conferences held about the leaky STEM pipeline, the unprepared STEM workforce, the failure to capitalize on the investments made in domestic STEM graduates, the racial/ gender disparities in the STEM workforce, and the wage gap in STEM fields, before we make measurable headway. I could list more of the STEM issues tackled on a daily basis by policymakers, academics and the public, but I won’t belabor the point in this piece as a simple web search will provide a comprehensive background and update on the discussion. However, as a contributor and a benefactor of the ongoing STEM discussion, I have to ask: will STEM lose its conversational prominence and if so will it be due to passivity, pandering, or progress? Written by Dr. Kenneth Gibbs Jr.
One of the most commonly used metaphors for describing the solution for growing and diversifying America’s scientific talent pool is the “STEM pipeline.” Major policy reports have called on the U.S. to enlarge it so it does not fall behind other nations. Scholars and the popular press have highlighted the need to fix pipeline “leaks” that result in the disproportionate losses of women and minorities. While this metaphor has been helpful in focusing attention on careers in science, I am increasingly convinced that it fails us because it limits our view of the problems and their solutions. Further, these failures are actually hindering efforts to enhance scientific diversity—that is, cultivating talent, and promoting the full inclusion of excellence across the social spectrum. The “pipeline” refers to the educational pathway—from elementary school through college, graduate school or the postdoc—that students complete in the pursuit of a STEM career. There are (at least) two big limitations with the metaphor. First, it reinforces the notion of a strict, linear sequence for becoming a scientist where none exists. There are of course certain benchmarks and competencies that need to be reached for one to be a capable scientist. However, if science wants to benefit from the talents of people from all backgrounds, then diversity efforts must focus on making sure there are more pathways that allow capable, hard-working people to join and participate in the field. Second, and maybe most importantly, the linear nature of a “pipeline” means that the only way to enhance scientific diversity is to increase the number of people from underrepresented backgrounds entering the system. That is, pipeline framing focuses attention on the number of scientists from underrepresented (UR) backgrounds, and takes focus away from whether the environments and systems in which they are educated and work are supportive and promote inclusion. A major presupposition of pipeline framing is that if more girls and women, minorities, or whatever UR groups were interested in science and progressed through the system, scientific workforce diversity challenges would be solved. While numbers are of course part of the issue, a study I recently published with my colleague Kimberly Griffin suggests that the reason for the lack of diversity is much more structural in nature. Professor Griffin and I have spent the past few years studying science PhD recipients. By definition, PhDs are committed to science—no one does that much schooling if they’re not. Moreover, having reached the end of the educational “pipeline,” a PhD recipient has navigated any potential barrier to access, retention, or persistence. Thus they provide an excellent group from which to test the idea that by increasing the number of trained people from UR backgrounds, we can enhance diversity. In our work, published in PLOS ONE, we surveyed a large sample of PhDs in the biomedical sciences (my home discipline). We asked them about their career preferences over time, as well as factors known to be important in pursuing a scientific career—mentoring, self-confidence and graduate school experiences. We also included objective measures—for example, the number of scientific publications they had produced and the types of institutions where they were educated. If the “pipeline” framing was correct, then one would assume there would be no differences in career trajectories of these Ph.Ds. across lines of race/ethnicity or gender after accounting for any potential differences in these important factors. However, our results showed just the opposite. When statistically accounting for any difference in these important factors, including objective measures, women and scientists from underrepresented minority (URM) backgrounds were 36-54 percent less likely than White or Asian men to express interest in a career as a faculty member in a research university upon the completion of graduate school. Further, URM women PhDs were twice as likely as scientists from all other groups to express high interest in a career outside of research. Among science PhDs who are otherwise similar on important metrics such as publication record, mentoring support and self-confidence, we still see differences in the career pathways they show interest in pursuing. This, in my view, means that simply focusing on getting more people into and through the educational system will not be sufficient to solve science’s diversity problems. Instead, efforts must focus on creating a system that highly trained and talented scientists from all backgroundswant to be a part of. To be clear, I support programs and initiatives that aim to increase the numbers of students generally, and from UR backgrounds specifically, entering scientific training. I have benefitted from many programs that support young scientists. These include the North Carolina School of Science and Mathematics, UMBC’s Meyerhoff Scholarship Program, the Leadership Alliance, the National Science Foundation’sGraduate Research Fellowship Program, and many more. Having more scientifically trained people, no matter what career pathway they take, is in my view incredibly important. However, efforts to increase the numbers of women, minorities and other UR groups in the sciences should be coupled with reforms that make sure the institutions training them, and the funding agencies supporting scientific research, promote inclusion. In addition to focusing on the number of individuals the system produces, policy efforts must also focus on making sure that all scientists have high quality experiences and are well supported throughout their education, training and career.My hypothesis is that if scientists from all backgrounds felt that they would be well supported in the scientific enterprise—particularly the universities where the bulk of federally-funded research is conducted—then we would start to see greater levels of diversity. Diversity is a byproduct of a highly functioning system that supports scientists from all backgrounds. Hence, we need to go beyond “the pipeline” and begin to tackle the institutional and systemic structures that lead to the loss of talent from diverse backgrounds in the sciences. In subsequent posts, I’ll share more on reasons why I believe these differences exist, and how we might begin to tackle them. About the Author: Kenneth (Kenny) Gibbs, Jr., PhD, is a Cancer Prevention Fellow at the NCI. He’s a lab scientist turned science policy-ist whose research focuses on strengthening the research enterprise through promoting inclusive excellence. Follow him on Twitter @KennyGibbsPhD and@STEMPhDCareers. Article reposted with permission from the author. Originally posted in Scientific American Voices Blog. Turn on the television, read social media posts, or talk to almost anyone affiliated with a technical field in the United States. Front and center is bleak news about the state of minorities in science, technology, engineering, and mathematics (STEM) education. From a recent American Institutes for Research report (Turk-Bicakci, Berger, & Haxton, 2014) that notes that underrepresented minorities with STEM Ph.D.s are more likely to work outside of STEM than their majority counterparts to University of Florida Ph.D. students’ Corey Baker and Justin Dunnavant’s post about the disparaging percentages of Blacks in the field of engineering versus Blacks in companies such as Apple and Google, messages remain the same. The number of minorities in STEM is low in undergraduate education, in graduate education, in the academy, and in the workforce. Despite best efforts by policy bodies and other organizations to address these challenges, concrete solutions to reconcile these disparities remain pervasive across sectors. Qualitative explorations about the state of people of color in STEM present similar, discouraging perspectives about the day-to-day interactions and experiences of people of color in the STEM workforce. From Dr. Carlotta’s Berry’s November 2014 New York Times post about being an African-American engineering professor at a small institution in the Midwest to my January 2014 Diverse Issues piece about how I was prepared to conduct the work of a professor but wasn’t ready for the challenges that I would face as an African-American female engineering professor, numerous stories highlight environments where STEM professionals’ credentials are questioned and where these highly educated individuals are disrespected in ways that are startling to most people who are non-minority or do not work in STEM careers. 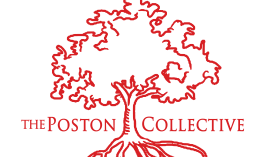 After almost nine years of working in an environment where I was the first and the only of my “kind”, I decided that it was time to take a break, or a sabbatical, from my institution. Offered to many faculty after at least seven years of continual employment at an institution, sabbaticals are designed to present faculty with opportunities to rejuvenate their minds and bodies; to innovate via their research, teaching, and service interests; and to prepare strategically for the next phases of their careers. Little did I know that my sabbatical would change and save my life. My primary sabbatical theme focused on entrepreneurship. Although I initially explored the expansion of an educational assessment tool to enhance teaching and pedagogical (teaching) feedback in STEM classrooms, I was drawn repeatedly to entrepreneurial activities related to the experiences of underrepresented groups in STEM. The more I reflected on my experiences as a woman of color in engineering, the more I realized that I wanted to create materials and products that empowered underrepresented groups who wanted to succeed in a variety of STEM environments. I was particularly interested in reaching those who would be the first or the only one in their professional environments. Hence, “Prepared to Be a Pioneer”™ (website coming soon at www.preparedtobeapioneer.com ) was born. Instead of waiting for someone to rescue me from the perils of isolation within the Academy, I am creating an entrepreneurial professional development brand focused on people who are Pioneers (vision creators), Propellers (vision implementers), Prisms (vision reframers), and Pillars (vision sustainers). Among my services will include coaching and consulting along with a professional compatibility service inspired by a friend and colleague who is a matchmaker. During my six month sabbatical, I have often reflected on my transition to entrepreneurship. Below are some thoughts that might guide others who, like me, are unique in their environments and wish to turn everyday problems into solutions that provide financial security and assistance to others who seek remedies to a variety of problems. Identify your pain point. This is the thing that keeps you awake at night. It is the problem that nags you during meetings. Often, you are the most likely champion for solving this problem, because the problem is personal to you. ACTION ITEM: Make a list of problems or situations that confront you most often. These could be technical or personal problems. Identify why they are problems to you, and write what your ideal solutions to the problem would be. Find the thought leaders and other people who are as passionate about your problem as you are. Most STEM professionals expand their networks at conferences or professional meetings. Traveling to conferences can be expensive, however. In the age of social media, finding potential collaborators or partners is only a click away. Subscribe and listen to relevant podcasts on iTunes or read blogs in your emerging areas of interest. Believe it or not, many people outside of STEM fields have great advice about ways to implement entrepreneurial ideas practically in a noisy entrepreneurial world. Begin reading publications and posts by the Harvard Business Review, Fast Inc., Forbes, Black Enterprise, or Entrepreneur. Getting out of your comfort zone is a giant step in a potential launch for a new business. ACTION ITEM: Using your social networks (e.g., LinkedIn or Twitter), find at least 5 to 10 new professionals with whom to connect. Once you connect, send an email or message informing that person why you would like to connect with him or her. Follow-up with these individuals periodically as you develop your entrepreneurial strategy. Develop a community of people who encourage you. These “Bad Day Buddies” are people who you can call or text when you have questions or reach rough spots in your business. The life of an entrepreneur can be lonely and sometimes scary, and creating this support network is vital for success. “Bad Day Buddies” are the people who will see your real personality and will have permission to provide critical feedback to you about your entrepreneurial journey. The key to success in “Bad Day Buddy” relationships is reciprocity. In the same way that you expect these individuals to be available to you, you need to be available to them when they need your support. Be open with them about what this looks like in your life. ACTION ITEM: Similar to creating a new professional network, identify up to 3 people with whom you are compatible and who understand you on a more personal level. Explicitly describe what you expect from your “Bad Day Buddy” entrepreneurial relationship, and negotiate areas where you are willing to provide entrepreneurial support. Success does not happen overnight. I wanted to have 50,000 Twitter followers, media appearances, and credibility in my new area in a matter of months after being an entrepreneur. Unfortunately, in the same way that I had to develop my STEM research and professional portfolio, I must develop my entrepreneurial brand. For this reason, I have learned about the importance of creating quality content, building an audience, and monetizing my services appropriately. More than that, I realize that my entrepreneurial dream requires that I work my academic job and spend my “spare” time working my entrepreneurial job with no guarantee that my efforts will manifest in the ways that I would like for them to manifest. To become an entrepreneur, areas of your life must change. Whether you hire employees or delegate current tasks to others, you have to shift priorities to launch your entrepreneurial venture. In the same way that everyone doesn’t pursue a Ph.D., everyone doesn’t succeed as an entrepreneur. Both efforts take work and commitment but can pay big dividends if you are persistent. ACTION ITEM: Revisit your priorities. Of the roles that you currently play, which are necessary and which are not? Deliberately add or eliminate activities that do not align with your entrepreneurial dreams. Do not allow, however, your overall well-being (e.g., healthy eating, exercise) to suffer with these shifting priorities. In conclusion, although I am not yet ready to leave my full-time academic position, I have become intrigued by the freedom and innovation associated with entrepreneurship. Instead of feeling that I am a victim in a system where I am one of the few or am the only one, I have found entrepreneurship to provide me with a way to translate the limitations that I see as a woman of color in STEM into infinite possibilities. Unlike a tenure-track position where I am overly cautious of how my actions are perceived by others, entrepreneurship places the onus on me. In the words of Henley’s “Invictus,” I am the master of my fate, and I am the captain of my soul. Lemonade, anyone? Age Ain’t Nothing But A Number: Should the NIH impose an average age for grants? Close your eyes and think of a scientist. What does this person look like? Is this person a man or a woman? Young or old? Stylish or disheveled? I’m willing to bet what you saw in your mind (especially if you don’t know any scientists personally) is something closer to a photo of Albert Einstein or some version of the characters on Big Bang Theory. Rarely do we imagine the stages between a student and full-fledged scientist. However, this “in-between” time often defines people’s scientific trajectories; decisions in this phase can be career making or breaking. Here’s what it looks like. The classic career path in science starts with an undergraduate degree, followed usually by a masters and then a doctoral degree. After the doctoral degree comes a “post-doc” or post-doctoral position where you train with a more senior scientist in your field to become an independent researcher. In other professions, the equivalent of a post-doc is an actual entry-level position with retirement benefits that counts towards professional experiences. Unfortunately, the post-doc is more like an extension of graduate school, where the pay is meager and the label of “trainee” leads employers outside of academia to ignore these years as “experience”. You might wonder how long this takes. Let’s do the math. If a budding scientist starts college at age 18, completes a BS in 4 years, finishes a Masters and PhD in 6 years, and trains as a postdoc for 2-3 years, then that individual is ready to start on an independent path at the age of 31 in the most ideal of situations. This means today’s “early career” scientists are 33 years old before they begin to look for work as independent scientists. 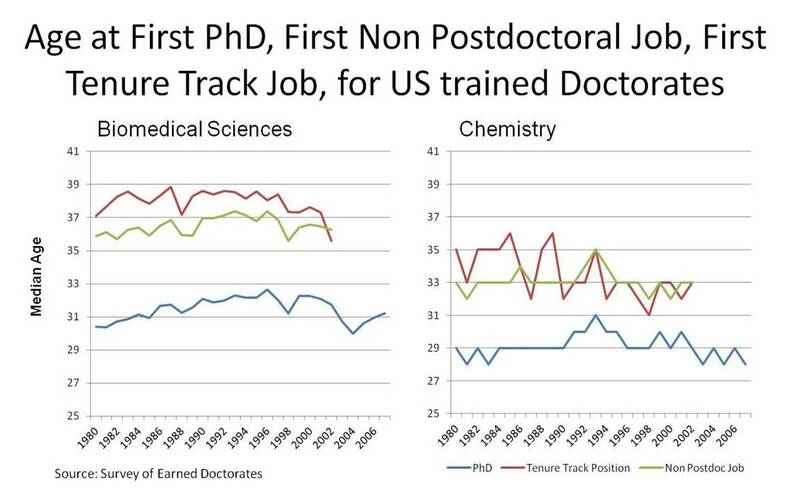 There are data to support this informal calculation: the Survey of Earned Doctorates shows that in the fields of biomedical sciences and chemistry people are not actually getting their first job after a post-doc until the age of 35. It is at this point that early career scientists on the tenure track begin to apply for R01 grants from the NIH. For my non-scientist readers, an R01 grant provides an average of $400,000 for a research project that is in line with the priorities of the National Institute of Health. These grants finance the academic biomedical research enterprise and are an important step for new professors to establish themselves with solid research and publications, which are often the measure of scientific productivity. Many universities require that new professors secure an R01 grant within the first five years of being hired to remain on the tenure track. Of course young scientists are not the only people vying for this funding; the competition is fierce and spans from early career to well established scientists. The average age of R01 recipients has steadily increased. In 1998, PhDs were awarded their first R01 at the age of 36; in 2014 that age is 42. These stats have sparked much debate. Maryland Rep. Andy Harris thinks that the age distribution of awarded grants should be mandated. And others have differing opinions. Some think this is a function of too many postdocs with few realistic employment prospects in academia. However, there are several other reasons that the average age of R01 recipients is in the 40’s and not the 30’s: 1) if students and post-docs are recognizing that academic prospects are slim, perhaps they are exploring other options that are related to science, but don’t require bench work; 2) perhaps post-docs and younger independent researchers are taking advantage of pathway to independence mechanisms like K99-R00, which provides NIH funding to bridge post-doctoral training and the process of starting a new laboratory; and 3) young post-docs may not be adequately trained to prepare competitive grant proposals to vie for an ever shrinking budget. Young scientists are facing more difficult grant reviews than their advisers faced at the same point in their career as a function of less money. They are keenly aware of the small number of tenure track academic positions available. They are intelligently weighing their options. Some will work through this difficult era in the academic sector, and they will be awarded R01 grants. Others will begin to explore other career paths like industry, science writing, policy, higher education administration, grant administration, and some may leave scientific research fields all together. None of these people will apply for R01 grants. Perhaps this is the source of the skewed age. More people are realizing that they can leverage scientific skills in other fields and find success. The age-old scientific career path that leads straight to the professoriate can no longer accommodate all who embark upon it. Young people, who are still training to be scientists are accepting that fact and making other plans. Trends at the NIH and elsewhere should and do reflect that. So while the stats are interesting, it’s safe to say that age is pretty poor metric to use for programmatic recommendations. Earlier this year, the College Board (parent of the SAT), announced several changes to its exam and services as part of a redesign effort. For those who qualify to take the SAT for free, College Board is doling out up to four college application fee waivers. For some students, standardized college-entrance exams are a barrier to college because of costs, test anxiety, or lack of academic preparation. Advanced Placement (AP) courses and other higher level courses such as Calculus and other high level English language arts courses, are viewed as courses that can prepare students for higher levels of course work, similar to what they will see in college. Students that enroll in such courses gain necessary skills and knowledge that propel them into more rigorous learning. However, according to the Civil Rights Data Collection, Black and Latino students make up 37% of students in U.S. high schools but only 27% of students enrolled in at least one Advanced Placement (AP) course. Students not only need to have access to such rigorous courses, but be supported to enroll and complete such courses if they aspire to attend college. Recognizing the financial barrier of college entrance exams for low-income students, college entrance programs and organizations have begun offering participants fee waivers for exams. However, the road to enrolling and attending college doesn’t stop after sitting for an exam or completing an application. Students must also submit that application, usually with a fee ranging from $50 to $150 per application. For most low-income students, this one application may pose a challenge for them and their family budget. They earned good grades, took the exam, scored well, completed a college application to a university that has their program of interest, but now what? This should not be the end point for any student. This goes against the notion that one will be able to “pull themselves up by their bootstraps” and use their education as a means out of poverty. I commend the College Board for taking this bold step to improve outcomes for low-income students. The College Board’s redesign, in my opinion, is call for state and local administrators and educators to step up to the plate and help all students, especially low-income students to excel. At the end of their high school careers, low-income students can have a waiver to take the SAT and apply to four post secondary institutions of their choice. The barriers to applying to post secondary education would no longer be financial. The only barrier would be academic preparation for the SAT through rigorous course work, instructional supports for those students in need, and access to AP courses. State officials, education administrators, and district level administrators and educators would need to ensure that the academic and social-emotional needs of all students, especially low-income students, are addressed so that they may have the educational experiences that would enable them to use this opportunity. This means higher standards, instructional supports for English Language Learners (ELLs) and students with disabilities (SwD), and most importantly, innovative ways to allow teachers to maximize their time with students and in schools. Up to this point in this post, my mind was optimistic with the idea that more young people would be able to see their college dreams come to life. Unfortunately, after I drafted this post the residents of Ferguson, Missouri saw a different picture of possibilities for their youth. Michael Brown, a recent high school graduate set to start college at the end of the summer, was fatally shot to death by a police officer. He was unarmed. My heart is very sad about this and the many incidents of police brutality and gun violence. What good is it if our youth have great opportunities but their chance of receiving them gets cut short by such acts of violence? The photos above are from my year of Teacher Tuesdays. The teacher described in this post asked to remain anonymous. K-12 STEM education is a concept that is often thrown around by teacher unions, parents, circles in higher education, and even the President in an address or two. Why so much interest? The answer is simple: Americans routinely perform below average when compared globally on Math and Science Exams. This is especially troubling as we look to the future of STEM and the preparedness of students to perform in these fields. Several of my favorite periodicals have zeroed in on teaching this week. The New York Times ran two pieces focused on teaching in America. The first found here focuses on the fact that while the U.S.A. does a great job at innovating the learning process, we are pretty awful at actually implementing these techniques in our schools. The author, Elzabeth Green states that main reason for this is because teachers are not taught how to teach the new methods. This results in students learning complicated methods, but not the concepts behind them. The second opinion comes from Joe Nocera. In his Op-Ed he discusses the increase in books aimed at creating better teachers and focuses on a book by Elizabeth Green (the author of the aforementioned article) that identifies the qualities of a good teacher and describes ways to strengthen those qualities in anyone. Elsewhere in the Atlantic, one teacher gives an account entitled ” I Lie About My Teaching“where he describes his lack of honest discussion with other teachers (a tactic that is hailed by Elizabeth Green) that likely stymies both his and his colleague’s improvement. All of this made me curious because teaching science, unlike history or grammar, comes with experiments and inherent hands on activities. I have some experience with this because I volunteered to teach at a local high school during graduate school. “Teacher Tuesdays” meant that I got to create fun, interactive lesson plans for three 9th grade biology classes to underpin the general concepts to be covered. Even though I only taught once a week, some challenges were obvious: there weren’t enough books for every student; resources were scarce and I often purchased materials for experiments myself; and there was a great deal of standardized testing, more than the just the end of the year exam. But even so, the students were engaged in my lessons and seemed to take something from our time together. I know my perspective from Teacher Tuesdays is skewed because this wasn’t my day job, my performance wasn’t evaluated based on student comprehension, and I was only there once a week. What event or experience in your life prompted you to pursue science at the undergraduate level? For most of high school, I considered history and English as my academic passions. At the time, writing essays and reading about history seemed to be more interesting than my science courses, which seemed a little dry. My school offered few AP classes for juniors, so I felt pressured to sign up for as many as possible my senior year. Two of the AP courses I took were AP Chemistry and AP Biology. AP Chemistry was the first class in all four years of high school that truly challenged me and though I was not successful all the time, I found this challenge was strangely motivating. As I learned more about the properties of matter and how chemical reactions occurred, my interest in chemistry grew. AP Biology further fueled my passion in the sciences once I saw how the two fields were so intertwined. By the end of my senior year, I decided that I wanted to pursue chemistry as my major in college so that I could one day help design pharmacological agents to help treat the ill.
Why did you decide that becoming a teacher was the best option for you? To be perfectly honest, I had no intention of becoming a teacher at first. My original plan was to finish college, take about 2 years off, and then enter medical school. It was not until a Teach For America recruiter contacted me in the fall of my senior year that I even considered teaching. As the TFA recruiter spoke to me about the organization’s mission ad vision, I couldn’t help but think of my own experiences attending an urban school in a low-income community. I had a considerable amount of teachers who invested in my education and no doubt played a significant role in my success today. I saw teaching as a means to give back to my community. After much reflection and several discussions with other TFA staff, I decided to apply. If I didn’t teach, I may have done healthcare consulting or worked as lab technician somewhere. When I was accepted to Teach For America, I was assigned to the Greater Newark Region. I soon learned that the high school I graduated from recently became a Teach For America placement school. Interestingly enough, I ended up being assigned to one of the buildings of my former high school. I was able to work with some of my former teachers and even had one as my vice principal. I did what I could to remind my students that being from Elizabeth, NJ was not a bad thing and tried to reinforce the idea that education was a way out. Provide a general description of the school where you taught. The school where I taught is one of the six high schools in Elizabeth, NJ. Prior to 2009, Elizabeth had one large high school—Elizabeth High School—that was composed of five “houses.” After 2009, the Board of Education decided to make each EHS house a separate “academy” that focused on a certain field of study. I taught at the Halsey Academy of Finance, which had 200 students in the building. The Academy of Finance was technically part of a larger school, the Halsey Leadership Academy, which housed approximately 900 students in the Main Complex. I would say that at least 90% of our students were eligible for free or reduced lunch and often came from low-income households. My class sizes ranged from 18 – 27 students, with an average of about 22 students per class. The graduation rate for Halsey Academy is 61% making it a “Focus School”. Focus Schools comprise about 10% of schools with the overall lowest subgroup performance, a graduation rate below 75% and the widest gaps in achievement between different subgroups of students. Focus Schools receive targeted and tailored solutions to meet the school’s unique needs. What was the most rewarding part of being a teacher? The most rewarding part of being a teacher is establishing relationships with students and witnessing their transformation both academically and socially. The classroom can be an incredibly impersonal environment and establishing relationships with students individually can be challenging, which is why conversations during lunch and after school were important. I treasured these moments the most. Finally, it was invigorating to see students who made huge academic leaps. One freshman went from consistently receiving D’s and low F’s to earning a B on his benchmark exam after he decided to attend tutoring and learn how to study effectively. Did you feel that students were interested in learning more about science? Unsurprisingly, many students were always interested in topics that were relevant to their every day lives. They loved learning about how the circulatory system maintained homeostasis as they also learned how to measure their radial pulse and measure a blood pressure. Their eyes gleamed with amazement when they learned how many of the foods they eat were genetically modified and were fascinated by the fact that an organism’s DNA can be changed by humans. One of their favorite chemistry activities was when they made their own ice cream while learning the concept of freezing point depression. I learned that students would be interested in a topic if presented in a way that personally connects with them. What are some of the challenges that students encountered as they tried to learn science? The great majority of my students were definitely not equipped to tackle a rigorous science education. Many of my students lacked basic literacy skills and came to my class with weak math backgrounds, which I feel was a major hindrance in understanding relatively complex scientific content. I had a 16-year old sophomore in my Biology course who literally did not know what the word “repetition” meant when I encouraged him to review his notes at home. I had another sophomore in my Chemistry class use a calculator to figure out what 32 x 1 was as he struggled to calculate the molar mass of sulfuric acid. He seemed truly confused when I told him that any number multiplied by one equals the same number. (He used a calculator and got 1031 as an answer.) My end-of-quarter test scores were consistently low. I did my best to break down test questions as I soon discovered that their low test scores were not necessarily because they did not understand the science concepts, but simply had trouble deciphering the question stems. How could I expect students to excel at rigorous benchmark exams when they literally could not understand the questions? Unfortunately, despite my great efforts to encourage them, certain students remained discouraged by their low test scores and felt that there was no point in trying if they were going to fail anyway. In addition to the skills gap in math and literacy, many of my students simply have trouble retaining content. I learned that a considerable chunk of my curriculum has already been covered in middle school, but most, if not all, don’t actually retain any of it. Density, for example, has been discussed repeatedly since at least the 7th grade, yet many of them still cannot explain or apply the concept. I often times wonder how certain students were even allowed to leave middle school not having such basic skills. Many of my students also had to balance many responsibilities at home as some of their parents often depended on them to take care of younger siblings or deal with certain errands. Some had part-time jobs, which they needed to help support themselves or their families. I had one remarkable Chemistry student who worked almost full time to support herself and pay rent every month, but still managed to earn mostly A’s and some B’s. Others had an unstable home environment and frequently moved. Knowing all this, I did my best to accommodate every student’s unique situation. What challenges did you encounter as a teacher? Why did you decide to quit? I faced many challenges as a teacher, but I will only discuss the main ones here. One challenge was that trying to teach students “college prep” science was an incredibly difficult task when they lacked basic skills as I mentioned above. After a year and a half, I had to accept the fact that this pace was simply not sustainable. Though I battled with feelings of guilt and inadequacy, I knew I needed to significantly reduce the amount of hours I spent doing work outside the classroom. Unfortunately, reducing hours meant I needed to “cut some corners” and to this day, I wonder how much my instructional quality suffered. At the end of it all, I had a very hard time with accepting that there were simply not enough resources to adequately teach every student in way that they needed. I often had to improvise when doing labs or avoid doing them completely due to a lack of appropriate lab equipment and chemicals. I decided to quit when my burn out became too great to manage and I began to truly hate my job as it continuously drained me of my time and energy. Once I felt that I was not becoming as effective as I would like to be, I had countless conversations with colleagues, my vice-principal, and my friends about the future of my teaching career. After months of deep reflection, I decided that I must resign from my teaching position and return to my original passion—medicine. Though I could have continued to “cut more corners” to make the workload more manageable, I don’t think I could ever live with the guilt of not dedicating every minute I’m awake to improving my instruction. In your opinion what should be done to improve STEM education at the high school level? Most professional development workshops and science department meetings do an excellent job at emphasizing the importance of inquiry-based and student-centered instruction. This is nothing new and my science supervisor often encourages teachers to create lessons that are “hands-on, minds-on.” STEM education needs to equip students with “21st century skills.” Science classes should teach students how to think critically, analyze and interpret data, develop sound hypotheses, and effectively communicate. I do believe that these skills can be learned if students are given multiple lab and project opportunities to actually practice these skills as students learn best when they are engaged in hands-on activities that are intellectually stimulating and not simply listening passively. Lectures need to be eliminated or at the very least be extremely limited as it leads to the least amount of retention. For this to be possible, benchmark exams need to be completely redesigned. These exams cannot remain in the format they are in today—75% multiple choice and 25% open-ended questions that require students to remember a great amount of arbitrary pieces of scientific knowledge. Because of the amount of content that is required to be “covered” by my district’s science curriculum, there is simply not enough time to teach every unit with an inquiry-based approach where students take several days to “discover” a new concept. At a certain point, lecture becomes the most efficient way of “covering” material. Assessments should require students to solve specific problems and demonstrate their entire thought process. These one-to-two-hour multiple-choice exams simply need to end as they do a poor job in seeing how students think and in challenging them to think “outside the box.” At the very least, exams should mostly be composed of open-ended questions that ask students to show their complete thought process. If school districts insist on standardizing science education in all their schools, the prescribed curriculum needs to explicitly describe what teachers need to prepare inquiry-based lessons as well as actually providing the necessary equipment to carry out some of these lessons. There were far too many instances when I had to modify a lab or simply not do a lab because I did not have all the reagents or equipment available. Virtual labs can only be effective at a certain point. Administrators need to decide which content is absolutely necessary for students to learn and how teachers can use a variety of projects and lab experiences to effectively teach that content. As far as getting more students interested in STEM careers, I believe that mentoring can enhance a student’s education. There should be some type of program that connects active STEM professionals from a variety of industries with high school students who can not only shadow these professionals, but actually contribute to a current project. STEM teachers can even include that work as a project grade. This teacher’s experience highlight several initiatives that were implemented with the best of intentions, but are adding to the detriment of K-12 education. If we consider Green’s article in the Times, which promotes extensive teacher training, then it becomes apparent that the Teach For America model does a disservice to both the people it places in the classroom and the students who are there to learn from them. This error is exacerbated by the fact that Teach For America schools are often low-performance schools, like the one described here, that would benefit most from the best, most seasoned teachers. This teacher also talks about STEM preparedness and knowledge retention. Math literacy or numeracy is a prerequisite to excel in any STEM field. High school freshmen who have become dependent on calculators without knowing concepts will likely lose interest in STEM because of their inability to perform. In the long-term, this reduces the pool of potential STEM majors in college and graduates on the job market. The theme that ran through this account, and the articles in the Times and Atlantic is the idea of adequate training. Teachers are given large curriculum overhauls and when the performance measures are not up to par in a single year, parents and policymakers push to change the curriculum again (Common Core Anyone?). This gives teachers no time to properly learn the best way to teach the curriculum and meet redesigned standards. Furthermore, as states trim budgets at the expense of education, teachers have less (paid) time to train and often times school districts lack the resources to provide said training. Placing blame is easy, but I encourage you to write a congress person or a state representative. Stop allowing education to end up on the cutting room floor. Perhaps better funded schools can both hire and train great teachers that meet national standards and improve America’s overall global competitiveness in education.